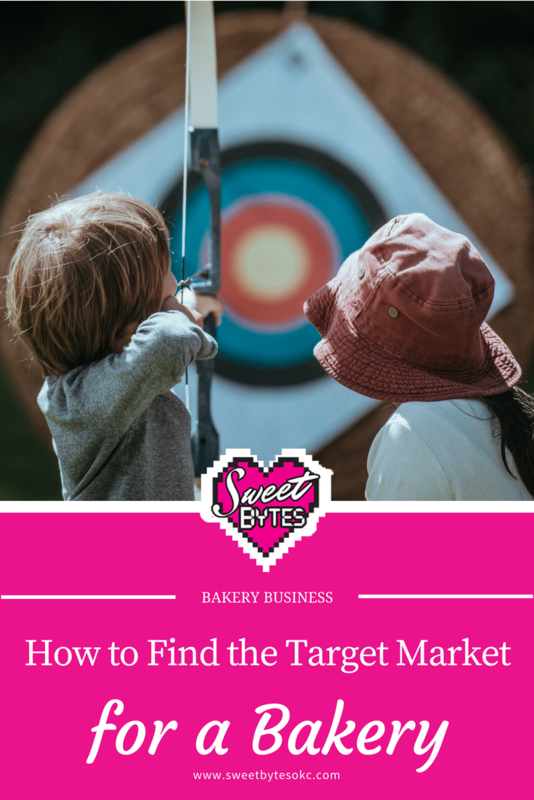 Have you figured out your bakery’s target market? If you are over there asking me, “What is a ‘target market for a bakery’?” It’s ok, that’s why I’m here, please ask me all the questions you have! A target market is simply the people who are the best match for your products and services. These are the people who are already out there looking for what you have to sell, and the people who will happily refer you to all their like-minded friends when they fall in love with your products! When you find the target market for a bakery, you can market your desserts to the right people, at the right time, in a way that will feel natural to them. This makes marketing feel a lot less pushy and a lot more fun. Consequently, If you are trying to sell anything anywhere, how to target your customers should be in your top 5 business strategies. It is so much easier to sell to an interested crowd than trying to convince someone to be interested. No, it’s not everyone who likes to eat. Why can’t it just be everyone who likes cake? Because you will blend into the background and not connect with anyone. Think about your own shopping patterns. You spend money on things that resonate with you. You like to be around things that fit your personality. In reality, you aren’t looking for people who are “meh.” about your bakery. You are looking for people who are “where have you been all my life? !” about your bakery! Now focus on this magical target market. Who are YOUR current customers? Who do you WANT to be your customers? Are they old people who used to bake and now they can’t? Maybe they are parents with a need for custom birthday cakes for the next 18 years? Are they aged 35-50 with highly demanding careers? You need to be able to picture this ideal person so that you can let them know all about how great you are. They will know it’s true because you will be hitting the bullseye! The “bullseye” here is their problem. You will be perfectly solving their problem! Could they be rich and money is no object? Are they on a budget and buying your desserts is a luxury? This person might be insanely busy and needs you to handle the details? Do they live a wild single life? Often, do they provide desserts for large groups? Look back at your past sales and look for patterns. If you’ve already been making sales, look back and make a list of your clients. Did they all have something in common? Did they all hear about you from the same place? Were all of their purchases in the same price range? Are you happy with the people who have been your clients? Do you wish you had different clients? Do not be afraid to proceed here. You will not cut yourself out of more business. This exercise will actually do quite the opposite. You will begin to attract the customers that you feel good with and then they will give you the magic key to success in business: referrals! Now picture this ideal client needing your bakery’s services. When does she buy desserts? For birthday parties and special events when they need to present the very best. She likes to stand out and put on parties but wants to spend hundreds, not thousands. You could get even more specific, but with this information, I know that I would be best suited specializing in custom birthday cakes for kids and accompanying up-sells like cookies, cake pops, and themed treats. Seasonal offerings will be HUGE with this crowd, so plan your year to include holiday menus and days to indulge, like Pi Day. After you know your target market, you can get to work marketing! You know where to target your marketing because you know where they hang out in real life and online. Ask that ballet studio or daycare if you can put up a flier, talk about your business! If you are going to pay for advertising, only pay to get in front of your target market’s eyes. Don’t waste money showing up in places where your ideal customer won’t see you. Nothing to it now other than taking some amazing photos and tell them where to find you! If you aren’t already amazing, don’t be afraid to admit it and get to work on your baking education. This can be a great time to start giving out samples and sharing your intentions with your real friends and family so they can start encouraging you and letting you practice on them. Yes, you can expand your target market! One more thing: Yes you can have a current market and an ideal market that you are hoping to expand into. Maybe now it’s kids cakes, but you have your eye on weddings. You can start planning to have those upscale clients as well as your other clients, especially since baking is very seasonal. You will market to each of your groups separately. Your Cookie Monster Cake won’t appeal to the bride wanting a 5 tier, sharp-edged cake with marbled fondant and flowers. It will be up to you to prove that you are capable of doing the work! Ok, that’s all I have for now. In conclusion, I hope that this helps you to start thinking about your customers in a new light! Truly, don’t be afraid to find your target market. It’s essential if you want to have customers you love who love you right back. If you have any questions, please drop me a line. This class by Michelle Green, The Business of Baking, is geared toward cake decorators, but it applies to anyone in the baking business with a desire to grow and learn to make the most of their time and resources. I am a Craftsy Affiliate partner and will earn a small commission on your qualifying purchase if you use my link to purchase any course or sign up for Bluprint. I only recommend things I love and trust.